The need for advanced office security and measures to prevent data loss is escalating. Potential security pitfalls range from employees accidentally seeing confidential information to unauthorized leaks and all the way to well-coordinated, malicious attacks on your network. Regardless of scale, these breaches can cause immeasurable damage to your business. Konica Minolta stays ahead of the danger by offering advanced security features to shut out intruders, secure your office and ensure the integrity of your most important asset, trust. 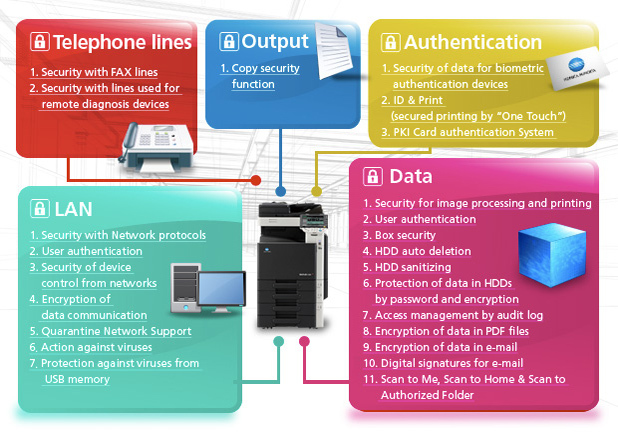 Konica Minolta MFPs feature a host of advanced security functions that protect your data from threats both in your office and beyond.Some security features and functions not available on all models. Improved overall OA equipment with increased security and reduced output volume achieved by IC card-based authenticated printing and aggregating & analyzing output documents.